SYRACUSE – It’s the middle of December, but it felt like the middle of January Tuesday night at the Wawasee Natatorium. In a budding rivalry between Northern Lakes Conference girls swimming powers Wawasee and Concord, it literally came down to the final points given. 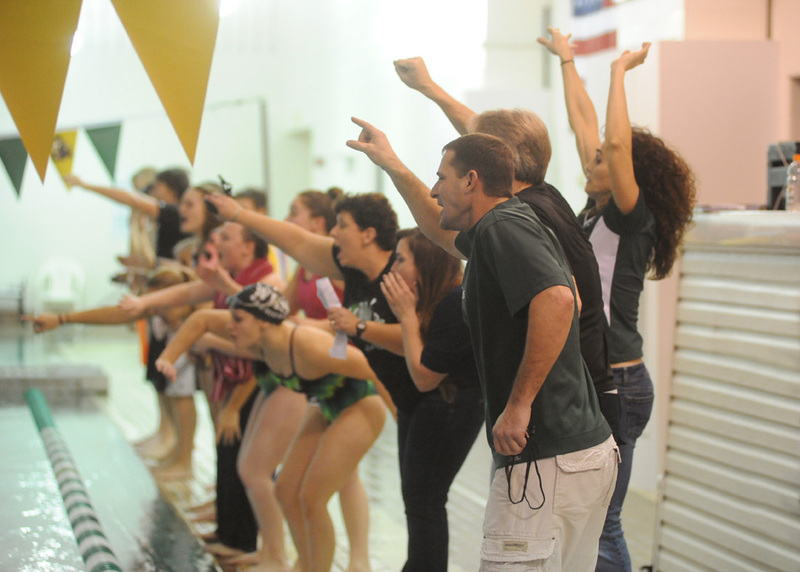 When the splash surged the south wall of the pool, it was Wawasee cheering loudest after a 94-92 victory. Concord held an 88-84 lead heading into the final 400 freestyle relay, and both teams knew the stakes. Both head coaches, Wawasee’s Julie Robinson and Concord’s Tom Johnson, shuffled their swimmers as best as they could to take advantage of the matchups. The focus likely would come to what relay would finish third, needing the all-important two points. As Wawasee’s ‘A’ relay of Kendra Miller, Kayla Hershberger, Paige Miller and Anna Park sailed to a 3:48.95 win, the focus shifted to the outer lanes. Concord’s ‘A’ relay team were swimming about their average, but Wawasee’s ‘B’ was sending the pool into hysterics from some unlikely heroes. Madison McBride, Clevenger, Brugh and Bre Robinson nearly caught the Concord ‘A’ with a 3:58.17 to Concord’s 3:57.95, but the Concord ‘B’ relay was about nine seconds short of Wawasee, giving the home side reason to jump around. The win was secured, keeping Wawasee unbeaten in the NLC at 3-0 and 5-0 overall. Wawasee, which had not had an opponent within 62 points in its first four victories, did claim seven of the 12 events but needed every last point in its limited depth. Paige Miller set the tone with a solid individual medley time of 2:11.56, besting Concord ace Ashley Schrock by over three seconds. Miller also won the 500 freestyle handily at 5:13.13. Robinson also was a double winner, taking the 100 in a pool-record time of 52.04, lowering her own mark of 52.98, and later winning the backstroke at 58.78. Kendra Miller was another surprise success story, winning the butterfly at 1:05.26, which was not only a lifetime-best, but the first fly win of her career. The 200 free relay team of Hershberger, the Miller sisters and Robinson won at 1:41.23, just missing the pool record by .29 seconds. Concord opened with a pool record in diving, where defending sectional champion Lauren Boone posted a 281.15 to clobber the old mark of 242.95 set by Goshen’s Julie Jesse. Concord’s Jenna Lechlitner was second at 216.50 and Wawasee’s Hannah Rhoades third at 189.55. Concord’s success was front-loaded, winning the medley relay (1:55.02), Sydney Shuff the 200 free (2:01.37) and Mariah DeFreese the 50 (25.74) all before the break. Concord led 38-24 and Schrock’s 1:10.57 win in the breaststroke set up the relay drama. Johnson felt really good about ending Wawasee’s 10-meet NLC win streak with his relay setup, making the loss a little tough to stomach. Wawasee will return to action Saturday in hosting the Wawasee Girls Swim Invitational which begins at 10 a.m.
Wawasee freshman Lizzy Brugh had a huge night for Wawasee, helping the team to the win. 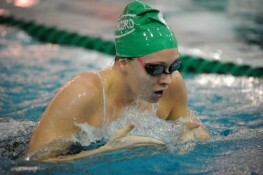 Concord’s Ashley Schrock continued her reign as one of the top NLC swimmers in the breaststroke with a resounding win. 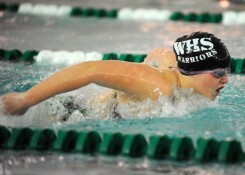 Anna Park of Wawasee claimed a valuable third-place finish in the 500 free. 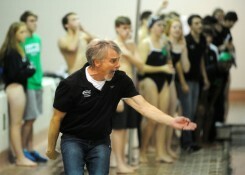 Concord head coach Tom Johnson encourages his swimmers during the final 400 free relay. Mikala Mawhorter of Wawasee works the butterfly.